The London Jewish Museum of Art is a small museum in St. John’s Wood, London, which opened less than 10 years ago. It was built up around the collection of the Ben Uri Gallery’s, a Jewish artists’ society begun in 1915, and has been steadily adding works from notable artists over the 9 years of its existence. But it’s the most recent purchase which has really put the museum on the map. David Glasser, one of the museum’s chairmen, found a previously unknown Chagall in the catalog of a small French auction house. The piece is a gouache, a painting made from opaque watercolors mixed with gum, from 1945. It’s one of several Holocaust-themed paintings made by Marc Chagall after he fled Nazi-occupied France in 1941. The gouache on heavy paper, which Chagall signed and titled himself lightly with a pencil in Russian — “Apocalypse in Lilac, Capriccio” — employs one of his familiar motifs, an image of a crucified Jesus, which he used as a metaphor for persecuted Jewry. 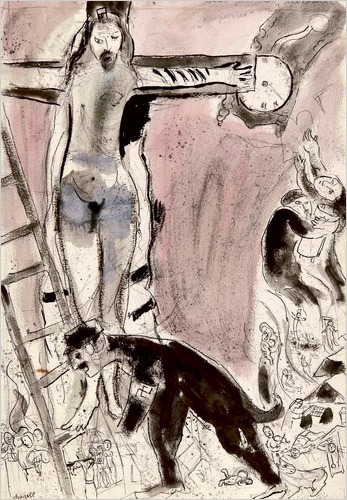 But this crucifixion, painted in New York, where Chagall settled for several years, is one of the most brutal and disturbing ever created by an artist primarily known for his brightly colored folkloric visions. Chagall never sold “Apocalypse”. His son David sold it to a private collector two years after his father’s death, where it remained for 25 years until it was put up for auction. The estimate was a surprisingly affordable 25,000 – 35,000 euros ($36,000 – $50,000) which the London Jewish Museum could actually afford. Just to be sure the price didn’t triple as experts thought it easily could, Glasser approached the Art Fund, a British philanthropic organization that gives institutions grants to help purchase expensive works. They guaranteed him an extra 100,000 euros (ca $143,000). He ended up not needing it. Maybe it’s the somber theme, maybe it was the sparsely attended auction, but for whatever reason, Glasser was able to buy “Apocalypse” for 30,000 euros (ca $43,000). The painting goes on display at the Osborne Samuel gallery in Mayfair this Thursday. At the end of the month, it will join the The London Jewish Museum of Art‘s permanent collection.